The first moment you step into your new Red Wings you probably wish for a second that you’d stuck to sneakers. We can almost guarantee that we are not going to get the same comfort right away. But once they’ve broken in there’s nothing like ‘em. 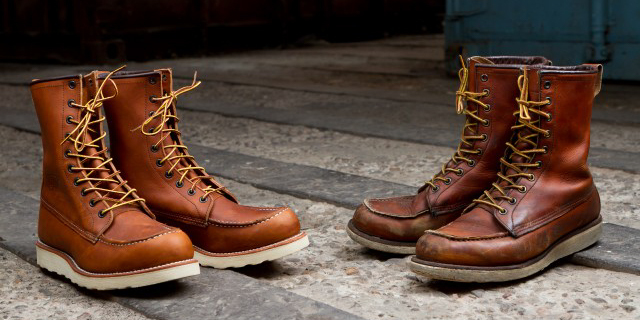 In this Part 2 of our definitive guide to your Red Wing Shoes, we are going to look at what you can expect while breaking in your new boots. Alongside this we will discuss at what your decision means on a larger scale. We look at the environmental implications of choosing quality over quantity and exactly where your boots come from, both physically and philosophically. Red Wings take time to break in. They provide outstanding quality, but there’s no promise that the boots will be your best friend after two days. It’s a relationship that has to grow. Don’t try to do too much too soon; you should not walk around for eight hours in a brand new pair of Red Wings. Try wearing them at home, let your feet get used to them slowly. A good sock will provide protection from the new stiff leather. It will also provide some cushioning for the foot. The notion of sustainability and material choice is becoming more and more prevalent nowadays. Customers want to know where the products they buy come from and if anyone or indeed anything suffered in the production process. 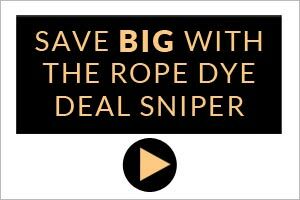 With the internet it is easy for people to inform themselves about such topics and this really makes a difference when it comes to product choice. So where do Red Wing Shoes sit in the scheme of things? They are first class in terms of sustainability and ethical manufacture. All Heritage models are manufactured in the USA. 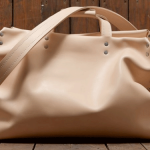 The leather itself is also domestically produced. It is all Texan leather and tanned in the S.B. Foot Tanning Company in the town of Red Wing, MN. 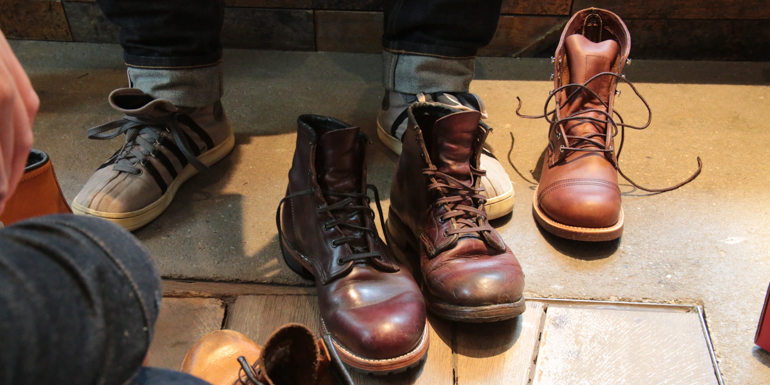 The Red Wing factory itself is also located there. This ensure’s a small environmental footprint when bringing the bulk of the materials together for manufacture. All other components are also produced in the US. Again ensuring less impact on the environment. Another advantage of producing in the USA is that it ensures that the boots are made in an ethically. 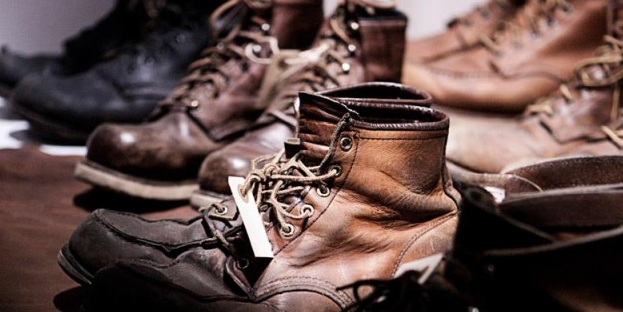 The workers in the Red Wing factory are paid a fair wage for a normal day’s labour. There is no child labour involved, no abuse of workers and the working conditions are closely monitored. The longevity of a pair of Red Wings is in itself has a positive impact. Unlike cheap boots or a pair of trainers; when you buy a pair of Red Wings you will not need to replace them in six month’s time. They will last you years. Having gone through the process of breaking in a pair of Red Wings before, I know what you’re in for.They will be uncomfortable for a while; you may get a blister or two, but after a couple of weeks you will be rewarded with a pair of boots that are truly yours. The boots will have broken in around your foot, giving support where it is needed and flexibility in all the right places. More than this, you can walk around knowing that these boots will last you decades if you treat them right. When you look at it in this way, a couple of weeks work for years of reward is not all that bad. 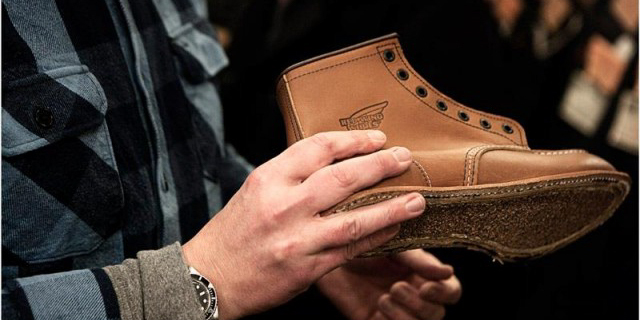 All in all, breaking in your Red Wings take patience and hard work, literally. To make sure you get the right fit and size, simply follow the tips in part 1 of our guide and I promise you will get a pair of boots that you will love and will be with you for many years to come. 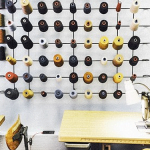 In the 3rd and final part, we will discuss how you can ensure a long and happy life for your Red Wing Shoes. 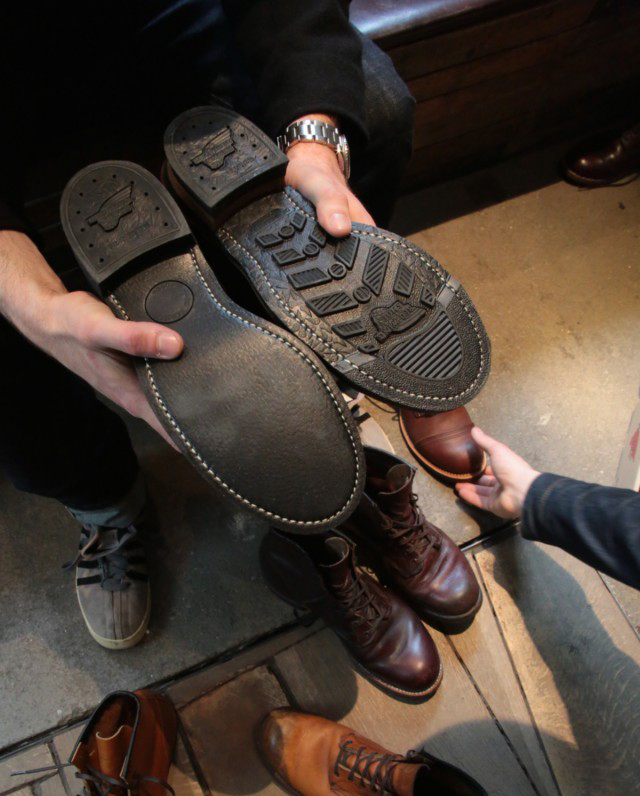 We will look at the various ways you can care for your boots and your options when it comes to resoling. Images courtesy of Axel Mosch, Nicholas Bech, and Red Wing Shoes. World Class Denim Repairs at Self Edge’s Repair Shop Darn-It!